Outlook Express is the largest and most popular mail client; offered by Microsoft company. It is a mail client but also a news client, available with Internet Explorer ( version 4.0 - version 6.0) and with Microsoft Windows Operating System 98 to Windows server 2003. 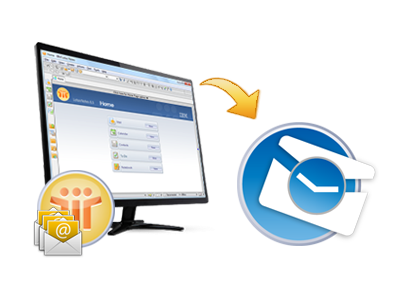 Every Mail Client keeps record of mails and all other things like contacts, notebook, tasks etc. into a file. These record files are different types of files and known as Database file and have different extensions. Microsoft Outlook Express saves it's mail in "*.eml" file and Outlook Stores it's mail into "*.pst" file. Whereas Lotus Notes which is a product of IBM Corp saves its mails in "*.nsf" database file. The Lotus Notes to Outlook Express converter tool provides the provision of converting all NSF file emails into EML file format along with embedded attachments. Each NSF email will be converted into separate EML file without harming metadata of respective file. Once NSF files are loaded with tool, by clicking on 'Start scan' option users can perform complete scanning of all NSF file data and can take a preview of all NSF file emails into software wizard. With the help of this preview option users can further choose the desired data to be export as EML file format. The entire URL's, HTML coding or any other formatting embedded within NSF emails will be retain as it is while in EML file format after conversion also. Emails will be previewed and accessed in same formatting while they are in Lotus Notes NSF files. The NSF to EML converter tool will also help to export bulk export of NSF files emails into EML file format by clicking on 'Export' option provided at top of software menu bar. This option will help to convert all contents of NSF file into EML file format without harming original contents of NSF emails. The tool will also help users to migrate selective NSF file emails into EML file format just by checking or unchecking the files or folders. After choosing the desired files for conversion users can press 'Start Conversion' option to migrate selective NSF emails to EML format. The user friendly interface of tool will help even non-technical users to perform NSF to EML conversion effectively without any sort of complications and also helps to maintain folder hierarchy of emails into EML file format. This will help in better data management of data. Does this software require Lotus Notes email client on conversion Machine? Yes, Lotus Notes to Outlook Express need properly configured Lotus Notes client to run the application. Is Outlook Express email client is necessary for using this software? No, Outlook Express Email client is not necessary while conversion process because EML is supported by many email clients like Windows Mail, Windows Live Mail, Mac mail etc. Can I use this tool in Mac OS? No, Software is windows based and need to install on any Windows Operating System. Is this software convert corrupt NSF File in Outlook Express? No, software requires healthy NSF files and full admin rights to perform Lotus Notes to Outlook Express conversion. Can I use this software on Lotus Notes 9.0 Edition?